Luxury vacations in Hawaii are among the most popular holidays for visitors from the United States and Asia. Whether you are seeking a tropical luxury vacation to enjoy romantic honeymoons, some of the best surfing in the world, or treks through lush rainforest-covered mountains with the entire family, you will find luxury trips to Hawaii to suit all tastes and interests. A luxury Hawaiian vacation is possible on any of the six major islands, and each of them offers its own distinct personality. Kauai is called the “Garden Island,” and is known for its lush forest-covered mountains, lovely botanical gardens, and sparkling waterfalls. Luxury vacations in Hawaii on this island are apt to bring you to the Grand Hyatt Kauai Resort and Spa, which offers breathtaking mountain and ocean views, a full-service spa, numerous dining options, and even a supervised children’s program. If your luxury Hawaiian vacation takes you to the Big Island, you will be able to explore Hawaii Volcanoes National Park and the volcano Kilauea that has been erupting continuously since 1983. For elegant pampering, you may want to head to the Fairmont Orchid, set in lush gardens on the beaches of the Kohala Coast. 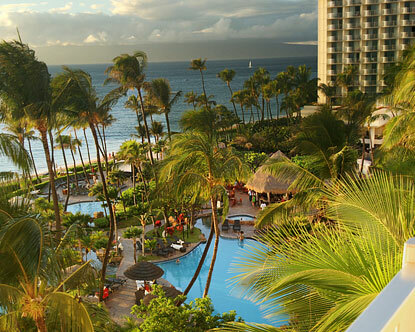 Or, you can enjoy pampering and world-class golfing at the Mauna Kea Beach Hotel. Here is one of the most beautiful golf courses in the world, designed by the legendary Robert Trent Jones. You will find the most cosmopolitan luxury trips to Hawaii on the island of Oahu, where you will find the metropolis of Honolulu and iconic sites such as Pearl Harbor, Diamond Head, and Waikiki Beach. The magnificent pink stucco Royal Hawaiian Hotel (also called the Pink Palace of the Pacific) has been a landmark on Waikiki Beach since its opening in 1927. It served as the Western White House for President Franklin Roosevelt and is home to the bar that claims to have invented the Shirley Temple. It is also known for its Royal Hawaiian Luau, one of the most lavish of the Oahu luaus. You enjoy your luxury Hawaiian vacation at possibly the best property in the state if you choose the Halekulani. Here is an oasis of serene elegance amidst the bustle of Honolulu and Waikiki Beach, and the hotel to choose if price is no object for luxury beach vacations. Some of the best luxury vacations in Hawaii will be found on the island of Maui, which has a remarkably high percentage of luxury hotels and resorts. Many of these are smaller, more exclusive boutique hotels that emphasize low-impact ecotourism, although there are larger resort complexes to be found around Kaanapali Beach and Lahaina. Wailea hotels offer more upscale resorts, including the beautiful Four Seasons with its sophisticated suites and rooms overlooking the golden beach. On the other side of the island in the charming village of Hana is the Hotel Hana, the oldest luxury hotel on the island set in 66 acres of plantation that rolls down to the sea. For more remote and secluded stays, you can head to the island of Lanai, home to two prestigious Four Seasons Resorts—the Four Seasons Koele and the Four Seasons Manele Bay. Some luxury trips to Hawaii never utilize a hotel at all. Many major cruise lines offer Hawaii cruises. Some of these sail from ports such as San Diego and Vancouver, and others embark and disembark in Honolulu. It is also possible to charter crewed and bare boat yachts to sail around the islands. Other visitors favor Hawaii vacation rentals over hotels, and there are luxury villas, mansions, and condos available on all the major islands.